Peter Silling and Associates’ office ... ergonomic design. TIG created an open-plan space. 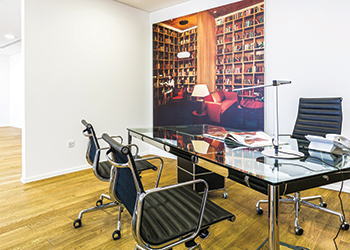 Large photographic stills from completed projects are used as artwork. Large bay windows let in ample lighting. The Interiors Group (TIG) has recently designed and fitted out a 1,937-sq-ft office space for Peter Silling and Associates at the highly prestigious Etihad Towers Three in Abu Dhabi, UAE, fulfilling the conceptualisation and fit within six weeks of receiving the client’s brief. Peter Silling and Associates specialises in high-end hotel interior design and has acquired the reputation of being one of the leading specialists in the design and realisation of international luxury hotels across the world. It wanted a space in sync with its own design values and concepts and one that would best harness its productivity and approach. TIG’s response is embodied in a minimalistic, high-end and luxury office interior, which is markedly a reflection of the nature of Peter Silling and Associates’ own work, reputation and profile. “Clients visiting our offices have commented on the quality fittings. We are very pleased with the finished project and can only recommend The Interiors Group,” he adds. Large photographic stills from completed projects are used as artwork. According to a spokesperson for TIG, its design team has created an open-plan office space, an office for the CEO and a boardroom for 10 people with full conferencing and audio-visual facilities. “The overall result is a sophisticated office interior with clean lines and a predominantly monochrome colour concept. Solid oak-wood flooring has been utilised throughout the office, and glass partitions, along with synchronising glass-top desks, are a classic foundation upon which the furnishings complete the luxury environment. Leather upholstered chairs along with chrome finishes reinforce the timeless quality in design,” says the spokesperson. Large photographic stills from projects previously completed by the client have been utilised as artwork across the space. The visual presence of the designer’s previous work provides a common ground for the creativity shared by both the designer and client – and serves as springboard for design and brief, according to the TIG spokesperson. White painted walls, LED (light-emitting diode) spotlights coupled with large bay windows and glazed meeting room fronts and facades provide for a well-lit space, which embraces its geographical setting with striking views of Abu Dhabi from every window. TIG has more than 27 years of experience in delivering stunning commercial environments. The company is widely proven and trusted by both clients and professional project managers to deliver business environments on time and on budget. 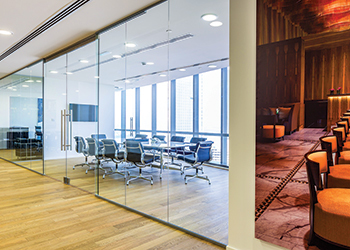 Among other recent assignments, the company successfully fitted out a sophisticated new office space for an international, research-based biopharmaceutical company situated in the Ubora Tower, Dubai. The scheme incorporated an open-plan workspace and a host of individual spaces for independent working, as well as informal and formal meeting rooms. TIG created an open-plan space. White walls, gypsum and glass ensures openness and fluidity across the office. Clever use of furnishing distinguishes each space and its capacity. Block colour walls in primary tones of red, blue and yellow define work spaces in respective areas for employees. The CEO’s office is an elegant and chic space. Timber wall panels and inset flooring complement white walls, whilst leather chairs add a feel of luxury to this room. At the far end of the office, a plasma screen is positioned on a wood-panelled wall with video and call conferencing facilities as well as a mobile, video-conferencing unit. “A combination of open-plan workspace, meeting rooms and facilities exemplifies the company’s modern working approach; for example, one room is dedicated to video-conference calls. “The Interiors Group designed this space with user comfort in mind; soft seating and individual laptop tables and partially opaque partitions allow users privacy and lets in natural light so that they do not feel closed off from the rest of the office,” says the spokesman. TIG has also installed a walnut and back painted glass feature wall in the 20-person boardroom. 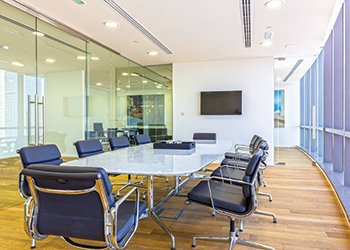 There are also a variety of four, six and eight-person meeting rooms for smaller team meetings as well as standing height desks for quick impromptu meetings.